A first half to forget cost Everton dear as the Blues suffered defeat at Emirates Stadium on Saturday. The Toffees hadn’t won at the home of the Gunners since 1996 - and that sequence was extended on a chilly evening in the capital. 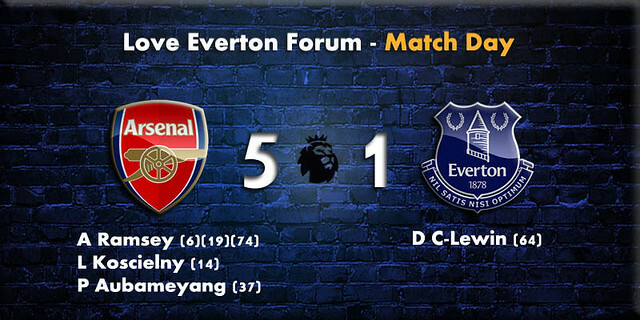 Dominic Calvert-Lewin scored two minutes after stepping off the bench, but by that time Everton already trailed to Aaron Ramsey’s double and further strikes from Laurent Koscielny and debutant Pierre-Emerick Aubameyang. Ramsey then completed his hat-trick with a quarter of an hour remaining to consign Sam Allardyce’s side to a disappointing reverse. Three days and two training sessions after switching from Manchester City, Eliaquim Mangala was handed his Everton debut in a reshuffled three-at-the-back formation. Ashley Williams returned as captain, as did Yannick Bolasie, Morgan Schneiderlin and Jonjoe Kenny, who took the place of Seamus Coleman on the right-side of defence. The Irishman, on the back of his outstanding comeback performance in the midweek win over Leicester City, did not travel to the capital. A speedy forward line of Theo Walcott, Bolasie and Oumar Niasse was selected to offer a threat on the break. Arsenal had lost 3-1 at Swansea City last time out but their home form had been impressive, with eight league wins already in north London during 2017/18. And it didn’t take long for the hosts to hit their stride, Ramsey, unmarked, sweeping home inside the six-yard box after Mesut Ozil and home debutant Henrikh Mkhitaryan had combined. Having been provider, the Armenian was only an inch away from scoring in Arsenal’s next attack. His crisp shot from 25 yards skimmed the outside of the post, with Jordan Pickford at full stretch. After deadline-day recruit Aubameyang saw a predatory goal-bound effort deflected wide, the Gunners bagged a second early goal. From the resulting corner, centre-back Shkodran Mustafi nodded towards the far post, where fellow defender Koscielny pounced from a matter of yards. Nineteen minutes in and the margin became three goals as Ramsey hit a first-time drive from distance, with the ball cruelly flicking off Mangala and Williams, wrong-footing Pickford and finding the target, despite the England keeper’s best attempts to keep it out. Everton’s efforts to haul themselves back into the contest first came via the boot of Cuco Martina, but the full-back’s volley from the edge of the penalty box was sliced wide. Minutes later only an outstanding piece of defensive play from Mustafi prevented Walcott - a scorer of over 100 goals in Arsenal colours - from netting on his return to the Emirates. The winger latched on to Niasse’s splitting pass and strode forward, only to see Mustafi slide in and divert his shot up and over the bar. Without a touch from the German, Walcott would have no doubt netted. However, Arsenal ensured they held a four-goal lead at the interval when Aubameyang clipped over Pickford, moments after the Blues goalkeeper had stood up to push away the former Dortmund striker’s run-and-shot. It should have been disallowed for offside but the assistant referee didn’t flag and the goal wrongly stood. Allardyce took off Keane and brought on Tom Davies at the restart, also altering the defensive formation to a flat back-four. It was a much better start, too - Walcott was unlucky that his fizzing volley struck Hector Bellerin, and the same Everton player then delivered a delicious cross from the right which was prodded against the frame by Niasse. The Senegal striker did all that he could on the stretch and was frustratingly denied by the post. Walcott’s evening was brought to an end on the hour mark. Unsurprisingly, he received an excellent reception from the Arsenal fans when he was replaced by Calvert-Lewin, in recognition of the 12 years service he offered to the Gunners. Two minutes after his introduction, Calvert-Lewin climbed to head a goal back for the Toffees. Davies passed to Martina and the full-back’s left-sided cross was powered in by the England Under-21 international - his eighth goal of the campaign in all competitions. Hope of an Everton fightback was extinguished, however, when Ramsey wrapped up his hat-trick a quarter of an hour before the end, the Welshman taking advantage of another Mkhitaryan assist to slot the ball low past Pickford’s left hand and complete the scoring. Well, that didn’t take long. Arsène Wenger has had one of his more frantic January transfer windows, the doors of the Emirates revolving like the barrels on a Las Vegas slot machine. Against Everton the fruits of Wenger’s toils clicked beautifully into place, as Henrikh Mkhitaryan produced a wonderfully deft display of attacking craft, Pierre-Emerick Aubameyang scored on his debut and the re-signed Mesut Özil played like he had just woken up surrounded by the most wonderful array of birthday presents. Aaron Ramsey’s hat-tick was the headline act as Arsenal ended up 5-1 winners. But at times it looked like it could have been more, before Everton finally found a little fight. For Arsenal the first half against Everton at the Emirates had a sheen of perfection about it as their new attacking signings began at a sprint, the entire team seemed to fizz with energy and Everton were basically torn apart. It was breathtaking, dreamy attacking football, albeit against opponents who appeared to have forgotten not just how to defend, but what defending actually was. In many ways this was the Premier League at its brash, spendthrift, shopaholic post-window best, with intriguing little nuggets of rejig and relocation shot through both teams. Wayne Rooney and Gylfi Sigurdsson were both benched by Sam Allardyce and Eliaquim Mangala made his debut. For Arsenal the new challenge of finding enough space to cram all their mature attacking galacticos into the same team kicked off with Mkhitaryan and Özil providing a dreamy-looking creative fulcrum alongside the muscular prompts of Alex Iwobi. They began at a sprint and barely let up, pressing hard in the early moments and scoring a beautifully worked goal after six minutes. Özil, who romped about here like a happy puppy, played a neat little pass into Aubameyang, who laid the ball out to Mkhitaryan on the right. Ramsey had space and time in the middle to tuck the ball home from his neat low cross. It was a goal that had some of that deceptive old Arsenal ease about it, the high-speed passing football Wenger is so keen to return to. And so it went on without respite. With 13 minutes gone Aubameyang had his first sight of goal, his shot from Ramsey’s fine cross blocked by a sprawling challenge. From Özil’s corner Shkodran Mustafi flicked on and Laurent Koscielny was free almost on the line to dive and head the second. Franky Everton were awful in those opening 15 minutes, slack in defence and unable to track the movement of Arsenal’s midfield into the spaces behind the wing backs. The third goal duly arrived on 19 minutes, at the end of another lovely, fluent move. Özil’s run and pass inside found Ramsey with enough time and space to think for a bit, scratch his ear and finally decide to sidefoot a shot that took a deflection off Mangala and found the top of the net. There was a glimpse of Aubameyang in full flight, scampering away into the huge green spaces and leaving four blue shirts for dead, but his low shot was well saved by Jordan Pickford. Aubameyang didn’t score, but this felt like a moment of triumph all the same, evidence of that supercharged speed still in reserve, the kind of speed that alters the entire vibe of a game, and which Arsenal have lacked in a No 9 since Thierry Henry left ten years ago. His goal was coming. And it duly arrived two minutes later. What a moment for Wenger, as Iwobi found Mkhitaryan, who turned and played the perfect nudged pass into Aubameyang’s run. His dinked finish was a thing of beauty, hanging in the north London air before nuzzling into the corner of the net wth Aubameyang already celebrating. Arsenal trooped off to giddy cheers at the break, a team transformed by their high-grade additions, albeit against fairly woeful opponent. Everton began the second half with a great surge of Sam-driven energy. Suddenly they were biting deep into Arsenal’s midfield as the home team looked a little sleepy and sated. Oumar Niasse hit the post, sliding on to Theo Walcott’s fine low cross and colliding heavily with Petr Cech. Walcott had been clapped on his return before kick-off, and left the pitch to warm applause from the home sections just past the hour. After which Everton deservedly pulled one back, the substitute Dominic Calvert-Lewin planting a fine header past Cech after Yannick Bolasie had crossed from the right. Cech left the field injured shortly after, suffering from his collision with Niasse. Tom Davies and Morgan Schneiderlin had been key for Everton in that period, as the visitors began to compress the spaces in central midfield. Ramsey demonstrated the other side of this with 74 minutes gone, striding forward and pinging a low shot past Pickford to complete his hat-trick from another perfectly weighted Mkhitaryan cross. Rubbish performance - not sure why he’s brought in Mangala on loan - didn’t rate him at City; don’t rate him here. 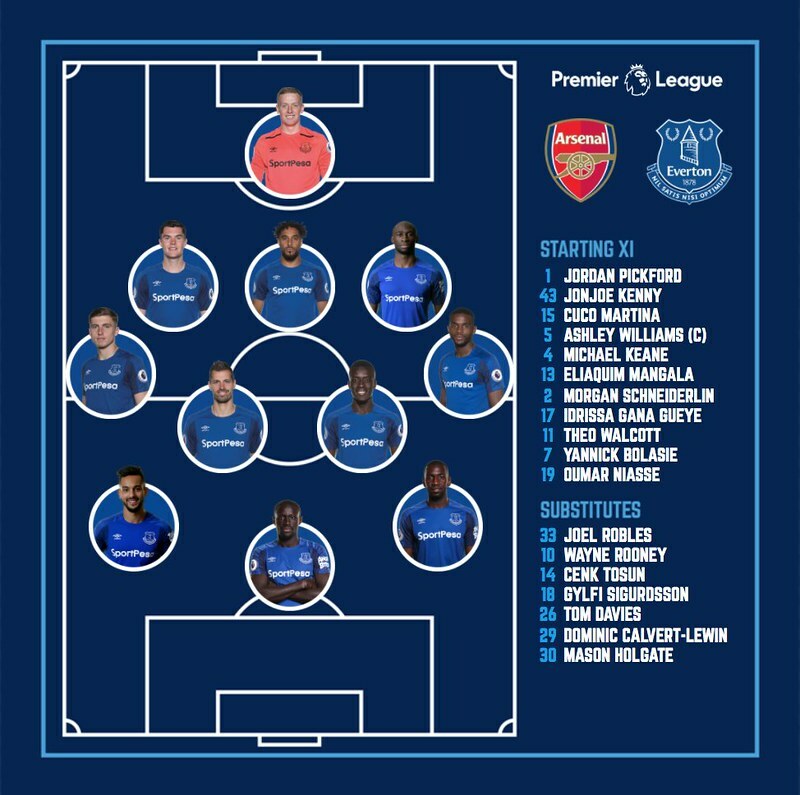 Liked the side he put out against Leicester a lot me - hopefully Coleman and Davies will start next week, and Tosun should be given a game.